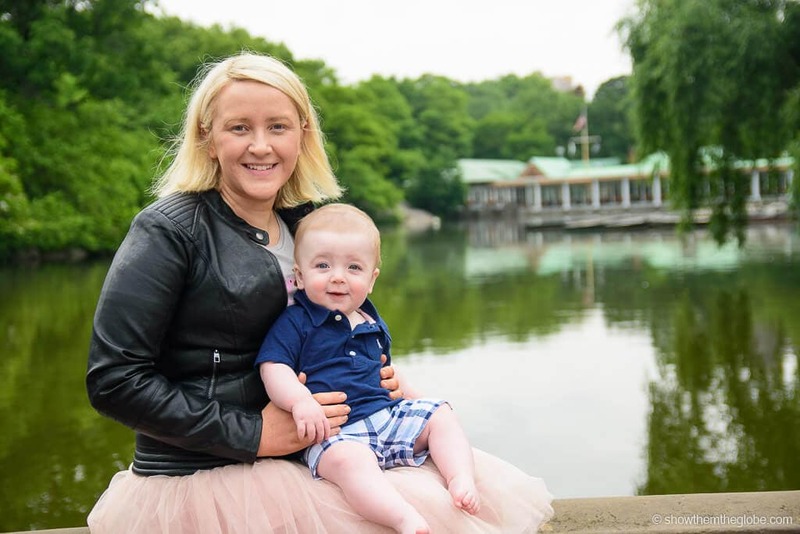 New York with a baby: family travel in NYC! We traveled to New York with baby J when he was 7 months old and loved our family time in one of the world’s most fun and chaotic cities. New York is the perfect choice for a family holiday and there are endless things to do in New York with kids. Together we explored its iconic sights from Times Square to Central Park and Brooklyn Bridge. 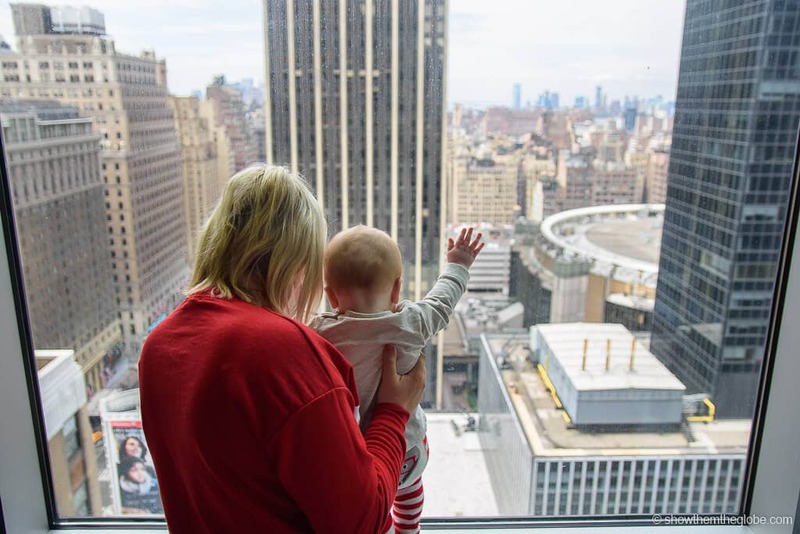 Here’s our guide to traveling to New York with a baby! As we were spending a week in New York we wanted somewhere spacious in a city where hotel rooms are notoriously small! Most hotels provide cribs and are very welcoming to younger guests. Residence Inn New York Manhattan Central Park: extended stay suites with fully equipped kitchenettes, washer/dryer and huge living space – check prices now! Click here for the best NYC hotel prices! Stroller or baby carrier in NYC? 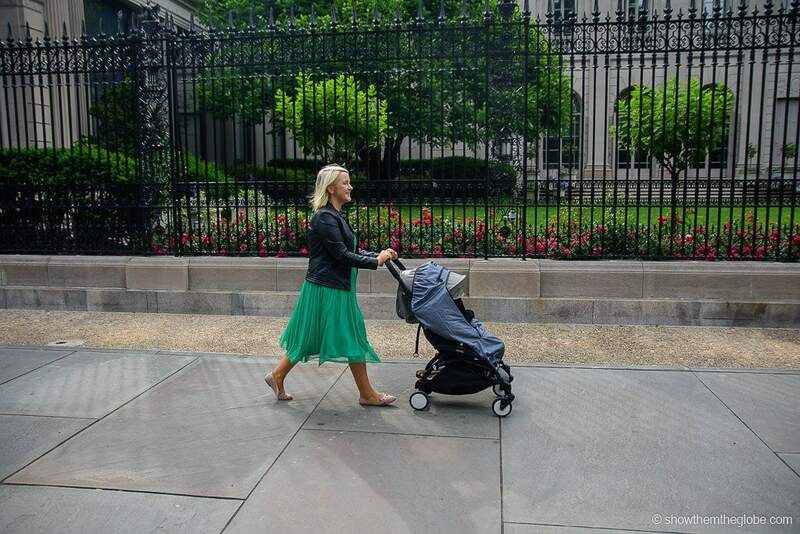 We traveled with a stroller and a baby carrier to NYC and used both countless times. The stroller was perfect for places that required a lot of walking: navigating the airport, exploring Central Park, early morning walks through the city and indulging in some retail therapy. We tend to walk for miles and mile while on vacation and New York is a city made for walking so it was great to have the stroller for J to relax in. For subway trips and exploring neighborhoods like SoHo, Nolita and Little Italy where the sidewalks are narrow and crowded we opted for the convenience of a baby carrier. We were happy we brought the stroller and the baby carrier and would recommend taking both to New York if you have the option. 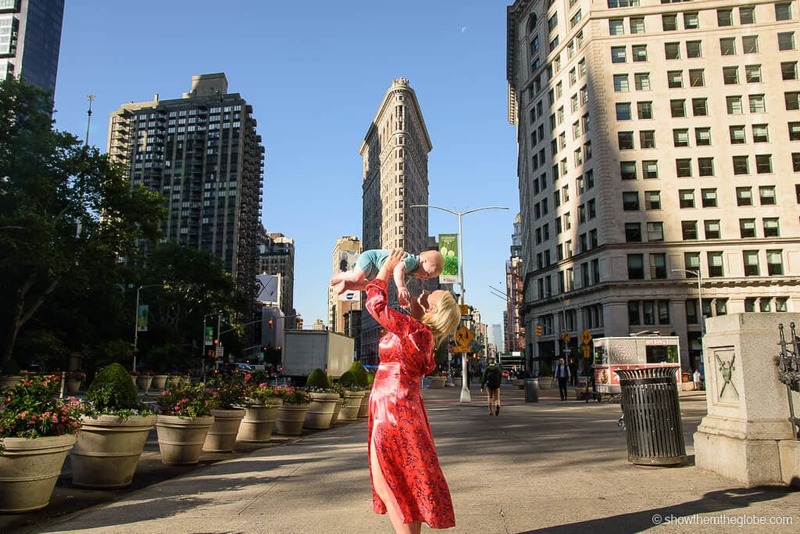 New York with a baby tip: we travel with the cabin friendly BabyZen Yoyo+ and an Ergobaby 360 baby carrier. Bring a compact, foldable stroller if possible as it’s just easier for navigating a crowded city and busy stores and restaurants. 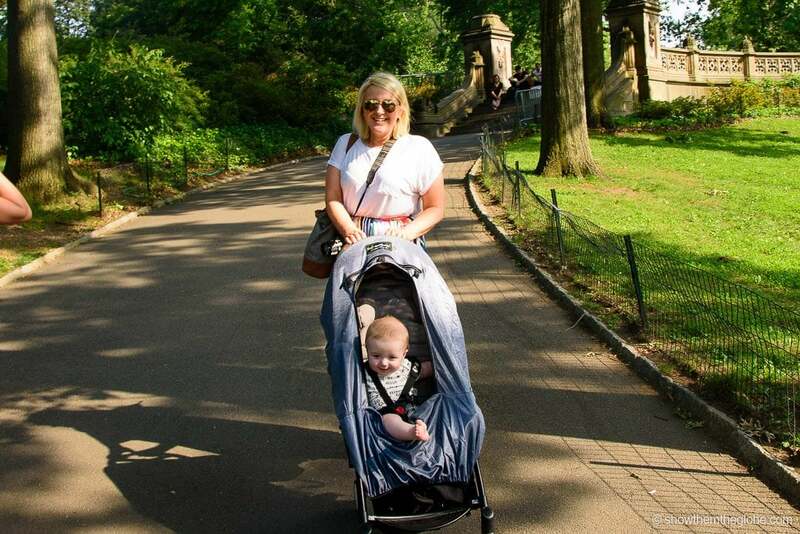 Central Park strolls with the stroller! From airport rides to navigating around the city, it is important to plan how you will get around NYC with a baby. The question of whether to bring a car seat on our trip was one of the first things we considered. Do I need to bring a car seat to New York? It’s an entirely personal decision as to whether you want to bring a car seat on a New York holiday. It is certainly possible to navigate the city without a car seat as the use of car seats and seat belts are not a legal requirement in taxis or for hire car services in NYC but this is obviously not ideal from a safety perspective in case of an accident. Do cabs/car services have car seats? Yellow cabs are not equipped with car seats while the ever popular Uber and Lyft offer family services with front facing car seats for older infants. There are some niche family-friendly car services which offer rear-facing car seats suitable for a baby but they tend to command a premium price. 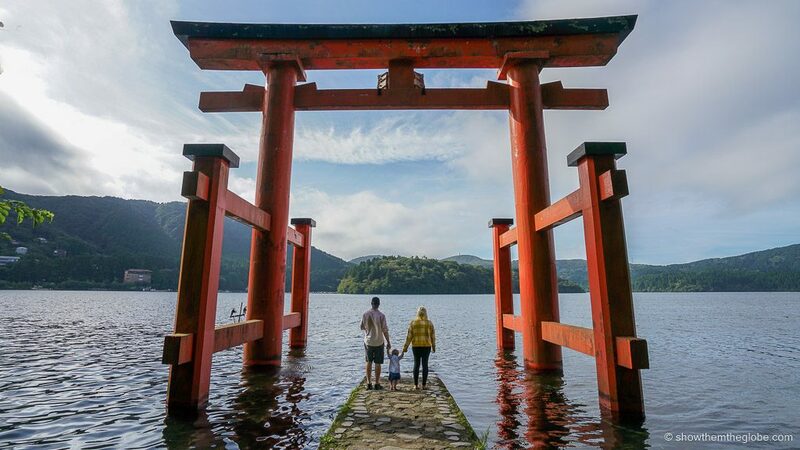 Kidmoto specializes in family-friendly airport rides and Empire Limousine is another popular option. Can I bring my own car seat? Yes! Passengers can install car seats in cabs or car services so it’s perfectly fine to bring your own. Most airlines allow an infant car seat to be checked for free so it’s relatively easy to transport and we spotted lots of strollers with car seats attached. New York City with a baby tip: we travel with a BabyZen Yoyo+ stroller which easily converts into a car seat stroller by attaching adaptors. This makes navigating airports and public transport much easier as J is able to sit in the car seat and we don’t have to haul an awkward car seat around separately! We used a mix of NYC cabs, Lyft and the subway during our visit. 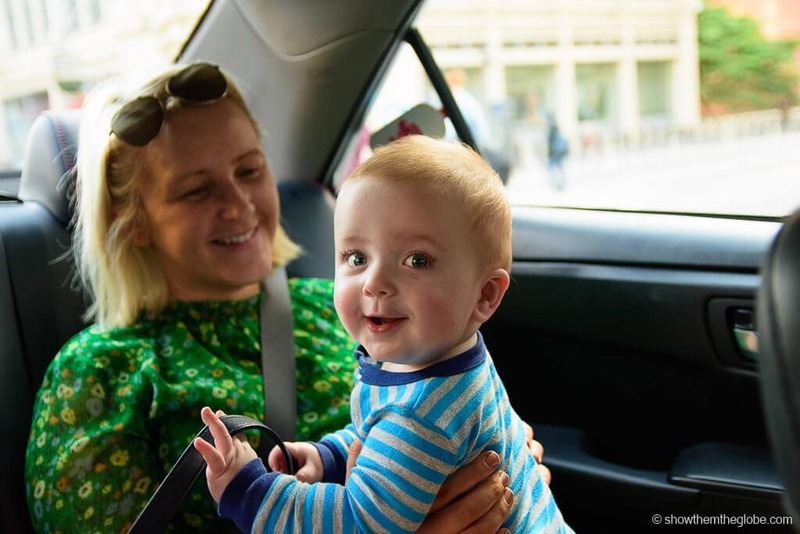 Taxi/Cab: taxis are exempt from requiring a car seat so, if you plan on grabbing a cab from the airport, you need to either bring a car seat or be comfortable taking a car journey with an infant on your lap. If like us, you find yourself with way more luggage than your pre-baby travels, it’s relatively easy to find a larger van style cab with more luggage room at the city’s airports. Uber/Lyft: Uber and Lyft are popular car services in the city and we would have been lost without our Lyft app. Both Uber and Lyft offer family services but only a front facing car seat is available. Lyft and Uber also have XL cars which can be booked through the app – these are more expensive but hold more luggage and passengers than the standard Uber cars. New York City with a baby tip: download the Uber or Lyft app on your phone before you arrive. If you need cell phone data then make sure to pick up a SIM at the airport or in one of the phone stores in town. Subway: the NYC subway is often the quickest way to navigate the city and there’s no reason to shy away from the underground when traveling with a baby. Many subway stations have stairs so we tend to use a baby carrier for convenience when taking the subway. If you prefer to use a stroller there are accessible stations throughout the city (there’s a list on the MTA website although they may not always work or service the actual platform) or you can fold the stroller and use the elevators or stairways. NYC with a baby tip: be conscious not to block the subway door or free seats with a stroller. Some signs request folding up the stroller which we noticed not many passengers do and it is not always possible if travelling alone with a baby. Buses: NYC buses are at the mercy of the city traffic and open strollers are not permitted aboard buses. As a result, we tend to stick to the subway or walking. 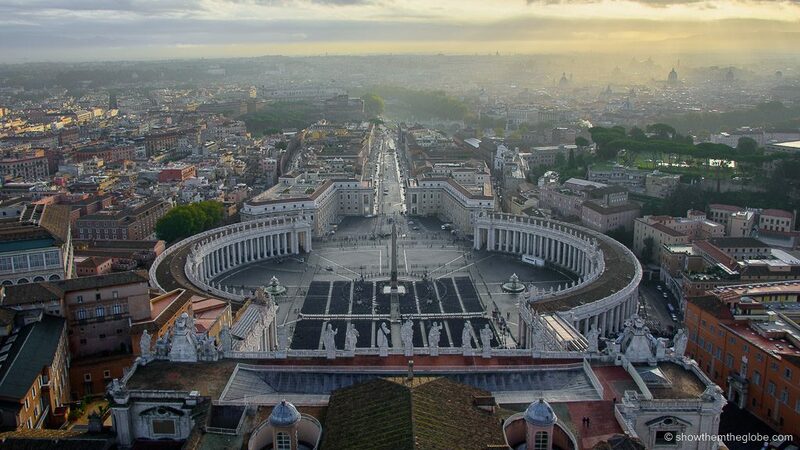 Babies are great travelers and don’t really impact sightseeing activities provided it’s a baby friendly activity. 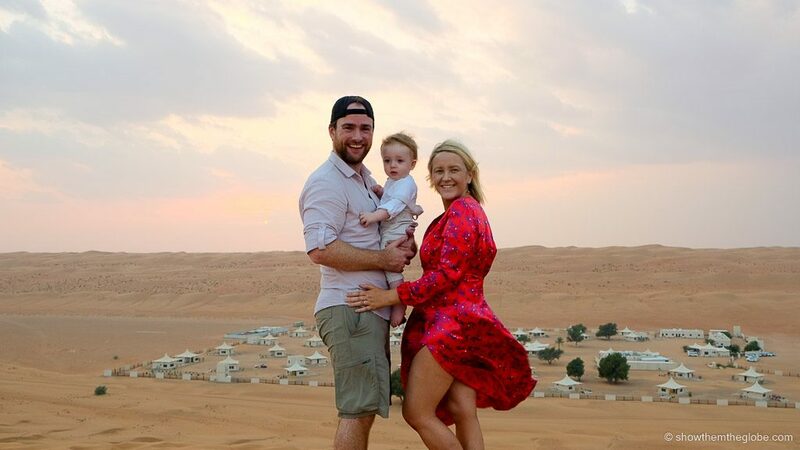 As long as J was cuddled, fed and comfortable he didn’t really mind what we got up to so our itinerary was almost identical to our pre-baby trips! 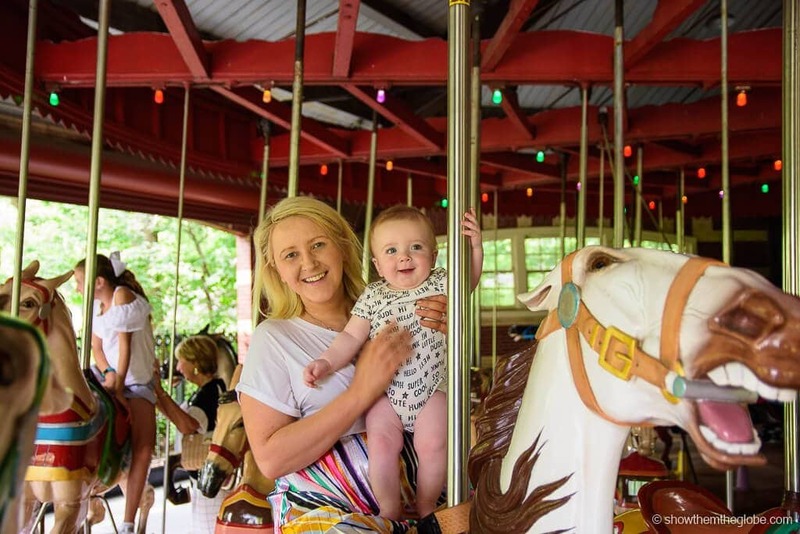 We did enjoy some baby focused things to do with J: our favourites were exploring the city’s parks, taking long walks through the city and riding some of New York’s most famous carousels. 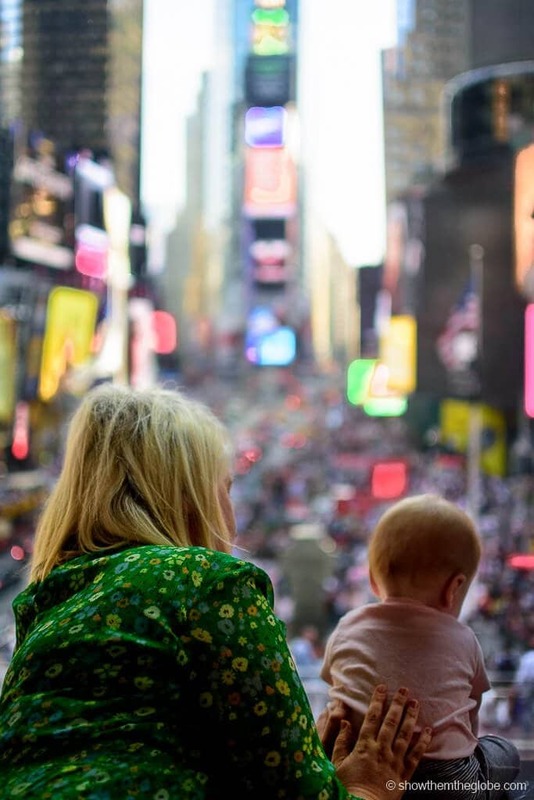 Check out our full guide on the best things to in New York with a baby! New York is a world-class city and, as a result, we had no concerns traveling there with a baby. There is an extremely high standard of accommodation, transport and hygiene and the tap water is good quality and drinkable. Travel insurance: always purchase travel insurance for the baby so you have access to private healthcare in the event of illness. This is especially important when traveling to the USA where health costs are very high. Healthcare: the standard of healthcare is excellent in New York. Eating out: New York is extremely baby friendly and most restaurants have high chairs readily available. We found it easier to eat out earlier in the evening when places were less crowded and more relaxed. Bars: lots of bars, especially those serving food, welcome kids although some restrict their entry to certain times of the day. As we used to live in NYC we had lots of catch ups with our NYC pals which J joined. Hotel bars are usually a great choice for family-friendly drinks. Supplies: supermarkets and pharmacies are well equipped with baby essentials and anything else you might need.